In many homes throughout the Northeast of the United States, oil tanks provide heat to families. Oil tanks are built to last for decades and can hold anywhere from 250 to 1,000 gallons of oil, depending on the size of the tank. However, problems can occur with this type of heating system as age, and the elements take their toll on the body of the tank. One of the common issues that arise with oil tanks is the formation of leaks. When a leak opens up along the body of a tank, petroleum oozes to the outside. Such leakage can inflict a range of harmful and damaging effects. Unfortunately, such damage is rarely covered under conventional homeowner's insurance policies. For coverage, you need to have an oil tank insurance policy. What Is Oil Tank Insurance? Oil tank insurance is a policy that provides coverage in the event of a leak or rupture in your oil tank. There are various ways that an oil tank can become damaged, and insurance gives you protection regardless of the cause. Leak protection: Instances of tank leaks can be damaging and costly when they occur. With oil tank coverage, you're protected financially against the possibility of a leak in the tank. That way, you won't be strapped for cash if and when a leak does occur. Repair coverage: Oil tank insurance covers the costs of repairs to a leaking oil tank. Whether the tank is located above or below ground, a repair crew will come to your property to remedy the situation and secure the structural integrity of your oil tank for continued use. Replacement coverage: If the damage to your tank extends beyond the point of repair, oil tank insurance will cover the cost of a new tank. Regardless of the size or positioning of your current tank, you can have its value insured for the price of a similar model in case the need should ever arise. Property coverage: Depending on the terms of a given policy, oil tank insurance can cover the cost of damage inflicted on property adjacent to a leaky oil tank. Moreover, oil tank insurance can cover the cost of cleanup and re-soiling on locations where underground leaks have infected the soil. Property insurance: Oil tank insurance basically functions as an extension of property insurance. Due to the fact that most of today's home insurance policies lack oil tank coverage, a separate policy for your oil tank in combination with your homeowner's insurance could give you a more complete and thorough coverage for your property. Whether your property is new or old, large or small, oil tank insurance is a wise investment when you consider all the things that could possibly go wrong on a property. With oil tank insurance, you won't have to foot the costs of tank repairs or an all-out replacement in the wake of unforeseen circumstances. How Does Fuel Oil Tank Insurance Work? 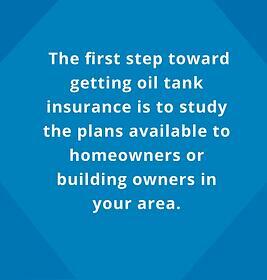 Choose a plan: The first step toward getting oil tank insurance is to study the plans available to homeowners or building owners in your area. Depending on the size or design of your tank and the amount of coverage you consider necessary, you could choose a basic or more extensive policy. Pay a moderate monthly or annual fee: Once your insurance goes into effect, you'll need to pay a periodic fee to keep the policy active. Depending on the terms of your plan or the policies of your insurer, your payments might be due on a monthly or annual basis. With some providers, you might be given a choice on the matter. Report any leak or accident to the insurer: If and when the day arrives that a tank leak does occur, you'll need to report the matter as soon as possible to your insurance provider. Before you contact anyone, however, you should write down a detailed description of the damage to the tank and the extent of the leak. Contact an oil-tank repair company: With information of the leak at hand, call your local, trusted tank repair service. Give the service representative a detailed description of the accident itself, and arrange to have an onsite inspection of the tank. Allow an on-site inspection: A repair specialist will come to your property to inspect the tank and assess the damage. On the spot, the specialist will probably be able to determine the cost of repairs and talk that out with your insurance provider. It's crucial that you be present during this inspection to gain an understanding of the issues at hand. Document the damage: As the tank inspector assesses the damage, take note of what they tell you about the nature of the problem. If you have a camera or smartphone, take pictures of the damage and leakage for further proof. Your notes and photos could come in handy if your insurer underestimates your claim. The amount of coverage you can get from an oil tank insurance policy will depend on the extent of the damage and the limits of the provider. A good policy will offer as much as $100,000 for soil remediation in the event of lawn or garden contamination due to a petroleum leak from an underground tank. Depending on the value of the tank itself, that same policy could also offer anywhere from $1,400 to $2,000 for a new oil tank. Once the necessary amount is determined and the claim is filed, your insurance provider will pay the repair company, which will send a repair crew to your property to fix or replace your tank. Is Heating Oil Tank Insurance Required? Homes: On residential properties that use oil tanks for heat, insurance offers protection against losses in the event of a leak. Without insurance, you could be faced with steep repair costs if the tank leaks or fails. You would also be at risk of living without heat if such repairs are beyond your budget. Apartments: In an apartment complex that uses heating oil, tank insurance is essential. If the tank is not insured, the building could amass high repair costs. In the meantime, tenants would suffer the consequences of a non-functioning heating system. In a worst-case scenario, tenants might have to cope with rent hikes to cover the loss. Business buildings: If you rent out office space in a building, you need to have your heating system insured. Without an insurance policy, the cost of repairs or an all-out replacement of the tank could be astronomical. If action on the matter stalls, the businesses that occupy the building will inevitably complain about the situation. Commercial businesses: Any business that draws foot traffic should have insurance coverage for their heating system. A bookstore, for example, should never become a place where people browse shelves and then have to sit down to read in the cold. The same principle applies to all other types of commercial businesses. Restaurants: Dining establishments must be capable of offering a comfortable environment during hours of operation. If a restaurant skimps by without oil tank insurance, the cost of repairs could ultimately eat into the owner's profit margin, which could be especially troublesome for smaller, up-and-coming eateries. Recreational facilities: Any place frequented by the public needs to have proper heating at all times. A gym, for instance, should never be without a functioning heating system, especially during colder months. Unless you're properly insured, the profit margin of your business is at risk. When you first buy a property, the oil tank might seem like a tiny part of the overall building and therefore only a minor concern. However, this assumption could prove costly at the most unexpected time if you don't have oil tank insurance. Oil tank repairs: If the damage to your tank can be contained and rectified, an insurance policy can cover the repair costs. Depending on the level of your coverage, you might be covered for the full extent of the expenses. With some policies, you might have to pay a deductible. A new oil tank: If the tank itself is beyond repair, an insurance policy could cover the cost of a new tank. The policy could also pay for the labor involved with replacement, such as the removal of the old tank and installation of the new one. Depending on your policy, these expenses will either be covered in full or minus a deductible. Cleanup of property: If the damage caused by an oil leak or tank rupture extends to neighboring areas of your property, oil tank insurance can cover the cleanup costs. For example, if the oil has splattered over a nearby wall or spot on the ground, cleanup could be included with the insurance-covered repair costs. Replenishment of soil: If the tank is located outside, nearby lawn soil could easily get polluted in the event of an oil leak. If it's situated below ground, the rupture could send oil directly into the soil. With an oil tank insurance policy, you could be covered for the costs of soil replacement. Peace of mind: When you have an oil tank insurance policy, you can live knowing that your tank is covered in the event of a leak. Considering the high cost of leak-related repairs, insurance gives you far greater security as a property owner. If and when problems arise, you're already covered. Protected property: The overall value of your property should be protected for as long as you occupy the address. Without sufficient coverage, however, accidents such as oil leaks could leave tremendous damage that could ultimately lower your property's resale value. Oil tank insurance is essentially one of many investments in property value. Transferable: Depending on the terms of your coverage, you might be able to transfer the policy onto the next occupant if you ever decide to sell the property. This offer could serve as another selling point when the property goes back on the market. Speak with insurance providers for more information. When you consider all the benefits of oil tank insurance, having a policy is really the ultimate form of responsibility as a home or building owner. With insurance, you're covered for any internal or external costs that could possibly arise when you own and operate an oil tank. Do I Need Oil Tank Insurance? An above-ground tank: An oil tank situated aboveground is exposed to moisture from the ambient air and is therefore liable to corrode if stored in an unventilated area. Without periodic cleaning, corrosion could lead to leak-causing holes. The tank could also be in harm's way in the event of a tornado or flood. With tank insurance, such problems won't leave you strapped financially. An underground oil tank: An oil tank stored below ground won't be as vulnerable to ambient air or natural disasters, but it could be damaged by expanding tree roots. If the soil is constantly saturated due to rain or irrigation, the tank could be subjected to corrosive water. An old property: If you live in a home built in the mid-20th century or earlier, chances are, the oil tank is old as well. Whether the tank has been there from the beginning or was added by the first or second occupant, the tank by now has seen decades of use and is thus more likely to have issues during your time at the address. A newer property: If your home was built within the last two decades, the oil tank should be safe as long as it has been properly installed in a sound area. However, if the tank is poorly situated and subject to harmful elements, problems could emerge during the time that you occupy the property — with or without a natural disaster. The effects of climate change could also be an issue over time. A tank for a building: For any building that's currently in use, oil tank insurance is essential. Regardless of the position or location of the tank, the stakes are too high when you consider how a faulty tank could affect the comfort of all the parties that lease space on the premises. A rarely used tank: If you live in a relatively hot climate, you might not be as concerned with your heat sources. However, condensation can also occur under humid conditions if the tank is stored in an area that lacks sufficient ventilation. In any case, insurance will have you protected if the tank leaks or malfunctions during those one or two months out of the year when you do need heat. Regardless of where you live or how often you use your oil tank, you should have it covered for all the times that you rely on its functions. 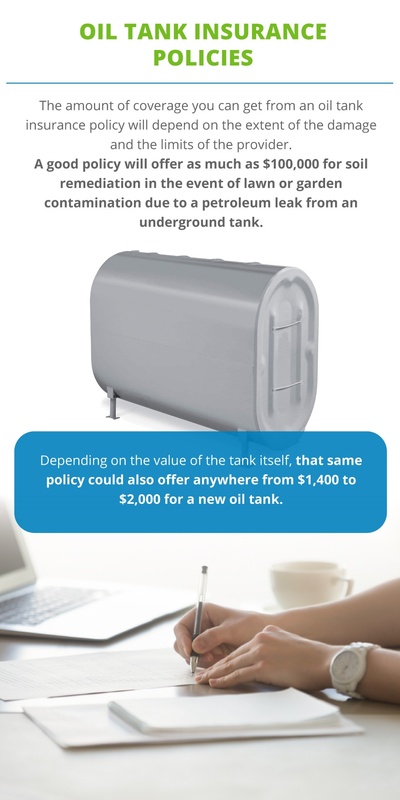 Vulnerability: Without oil tank insurance, you risk being stuck with any random costs that could arise in the event of tank damage or an oil leak. As with any piece of property, the wisest course of action is to secure its value. When you consider the importance of your oil tank, it becomes clear that the stakes are too high to skimp by without insurance. High repair costs: When uninsured, the repair costs for an oil tank could run into the four figures. Such costs are just too high for most homeowners to bear at a moment's notice. With oil tank insurance, all or most of the expenses for repairs or tank replacement are covered. Property damage: Oil leaks and other tank-related issues don't just affect the tank itself. A leak, for example, can spread to other parts of your property and leave multiple damaging impacts, from stains to air pollution. Depending on the extent of your policy, oil tank insurance can relieve you of most or possibly all of the financial burden, including the peripheral damage. Environmental effects: Oil leaks are bad for the environment. If leaking oil saturates the soil in a residential lawn, the potential impacts are bad for the growth of grass, the cleanliness of air and the health of pets. The larger the leak, the worse the possible impact. With the right type of insurance, you can have these kinds of messes cleaned up with little or no out-of-pocket costs. Lack of heat: Skimping by without oil tank insurance could lead to some very uncomfortable fall and winter months. What if, following a lengthy humid spell, you turn on your heating system for the first time in months only to find that it no longer works? If you're uninsured and strapped for cash, your family might be forced to wear bear costumes until spring. Depreciated home value: The damage left by a tank rupture or leak could have a negative impact on the value of your property. After all, if the property relies on an oil tank for heat, prospective buyers will expect that tank to be fully functioning and free of defects. With oil tank insurance, you can have such issues taken care of before you place the property on the market. Without oil tank insurance, you leave yourself at risk of urgent, unexpected repair costs that could drain you financially. If you try to tough the situation out, the unfixed tank could exert irreparable damage to your property. Moreover, you'll be forced to live without heat. For these and other reasons, oil tank insurance is essential. At Smart Touch Energy, we've been providing heating oil to Northeast homes for 85 years. Today, we serve customers in New York, Connecticut, Rhode Island, New Jersey, Massachusetts, Pennsylvania, Maryland, New Hampshire, Delaware and Maine. Through this website, customers can purchase heating oil and energy online from us 24/7. Explore our site now to check prices and create an account.